EXCITING NEW LINE - Check out Shopkins celebration of their 10th anniversary with these REAL SHOPPER PACKS! NATIONAL BRANDS - Each one of these Shopkins are inspired by all of your favorite brand foods and snacks. 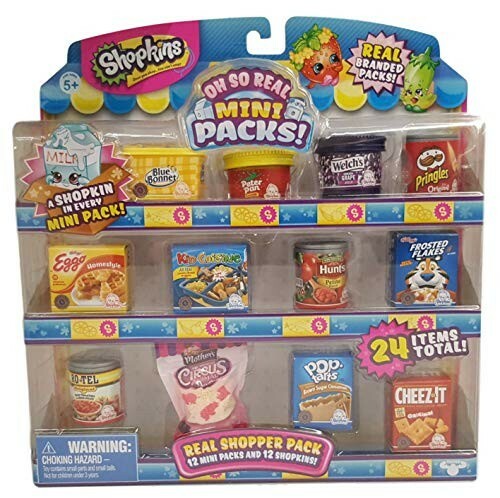 JUST LIKE THE REAL THING - Shopkins has entered licenses with major brands to bring you this new line and they look just like the product you can find on the shelves at the grocery store. ALL YOUR FAVORITES - Blue Bonnet Butter, Peter Pan Creamy Peanut Butter, Welch's Grape Jelly, Pringles Original, Kellogg's Eggo Homestyle, Kid Cuisine All Star Chicken Nuggets, Hunts Petite Diced Tomatos, Kellogg's Frosted Flakes, Rotel Original, Mother's Circus Animal Cookies, Pop-Tarts Frosted Brown Sugar Cinnamon and Cheez-It Original Crackers HUGE COLLECTION - Each package comes with 24 total items - 12 mini packs and 12 Shopkins. Get both styles for the complete set today! This product is listed on amazon using an ASIN of #B07KYS5CBJ	. Product prices and availability are accurate as of April 13, 2019 and are subject to change. Any price and availability information displayed on Amazon at the time of purchase will apply to the purchase of this product. Certain content that appears above comes from Amazon Services LLC. This Content is provided 'AS IS' and is subject to change or removal at any time.